Water under a film of paint in corroded steels was visualized using thermal neutrons at the RIKEN-accelerator-based compact neutron source. Two painted plate samples made of normal steel and corrosion-resistant alloy steel were prepared. Both were scratched on the painted surface and then subjected to a cyclic corrosion test to generate blisters caused by under-film corrosion. They were soaked in water for 2 h and then removed from the water. 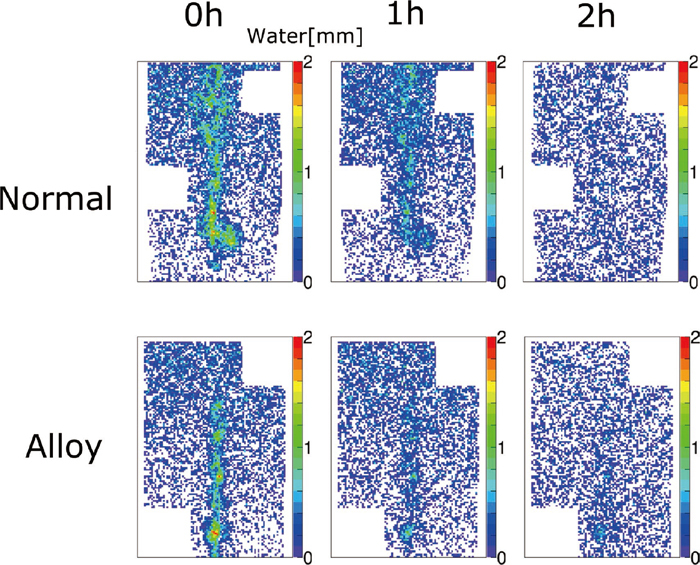 Time dependences of the water distribution in the under-film corrosion were observed using the neutron transmission imaging method for the first time. The alloy sample contained less water than the sample made of normal steel and the water in the alloy escaped from the sample more rapidly than that in the normal steel. We also evaluate the corrosion resistance performance of the painted steel sample.